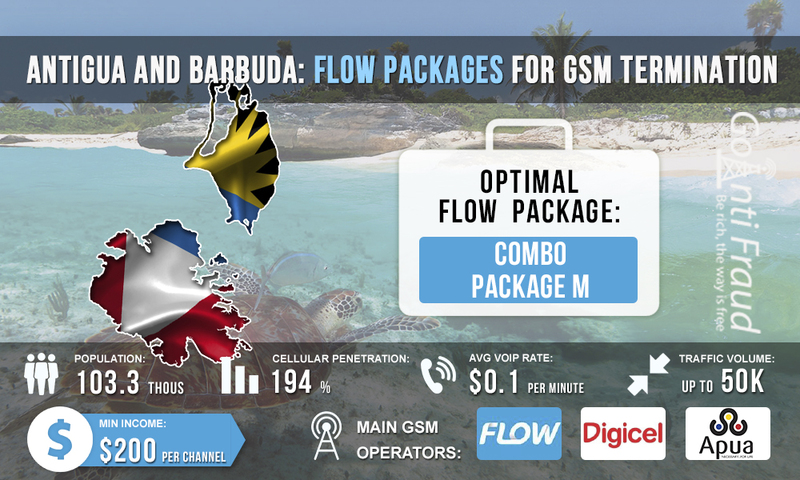 The cellular provider Flow in Antigua and Barbuda is the leader of the local mobile sector. At the same time, it has a little difference in the number of subscribers compared with its main competitor Digicel. Since this operator transfers the largest amount of voice traffic in the country, it is recommended to use Flow SIM cards to earn money on termination. The cost of one start plan of Flow in Antigua and Barbuda is about $3.7. However, in the operator's official store you will be asked to present your passport. Therefore, it is better to find SIM cards at kiosks or from street merchants, where you will not be asked to show your ID. The standard price for calls to the numbers of any operator (for prepaid customers) is $0.35. It is very expensive for the terminator, with an average rate of about $0.1 per minute in this direction. Fortunately, one can still find advantageous proposals in the form of packaged offers. XS. Provides 50 minutes for calls, the cost is $3.1. Duration - 1 day. S. Provides 100 minutes for calls, the cost is $7. Duration - 3 days. M. Provides 300 minutes for calls, the cost is $11. Duration - 7 days. Provides 1000 minutes for calls, the cost is $14.8. Duration - 7 days. XXL. Provides 2000 minutes for calls, the cost is $44.4. Duration - 30 days. The best choice for operations in the field of termination is Combo Package M. With this package, the price per minute of a call will be about $0.03. In this case, the terminator’s earnings will be at least $ 300 (when operating the voip gsm gateway beograd or other VoIP equipment for 300 minutes a day).